Home » Blog » What’s free today? Hi Forklift Fans – it’s Free Friday again, which means that our pricing team has marked items all over the warehouse with neon “FREE” stickers. 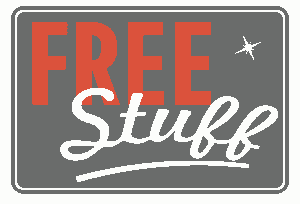 This week, the free items include: table saw parts, a swivel store display (great for displaying jewelry), a small shelving unit, a jukebox shell that still lights up, a pedestal table base, a stand up desk, and a vintage metal industrial book shelf. In addition, our August Specials include 50% off window, sink, tubs, and counters – get more details here.